Until as recently as November 2016, Yleisurheilu was only playable for anyone capable of understanding Finnish with ease, because the game features abbreviated words. If I have understood the Denial forum messages correctly, the translations were made mostly by a Swedish bloke with the handle "e5frog", but only the VIC-20 version has been translated so far. This means that there are very little of internationally understandable instructions available for at least the C64 version, and I shall be attempting here to deal with this issue. Top row: VIC-20 initial screens. Left: loading screen. Right: title/main options. Bottom row: C64 initial screens. Left: TV type options. Right: title/main options. 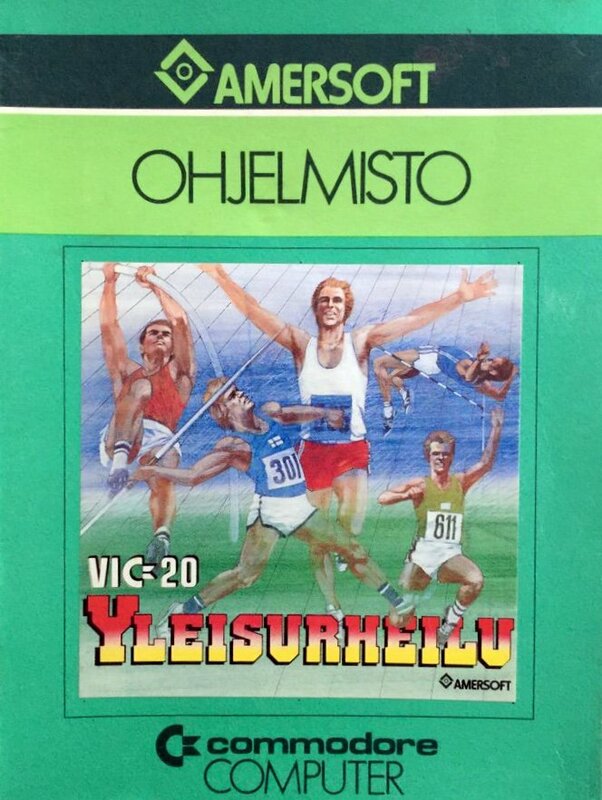 Yleisurheilu, which translates to English as "Athletic Games", is a multi-event sports game, which is played in a clear order, because it was designed to be played from tape as much as from disk. It all starts from an entrance screen, in which you enter as many contestants into the game as you wish. The VIC-20 version actually enter 60 contestants due to a bug in the code, but if you do so, the game crashes after loading the first event. Officially, the maximum number of contestants is 6 on the VIC-20 and 4 on the C64. The C64 version lets you choose your starting event, but the VIC-20 version always starts from the beginning. The VIC-20 version comes off as a bit of an odd-ball, since you play the game using a paddle controller. When using an emulator like VICE, you are somehow supposed to use a mouse to emulate the paddles to get anywhere. This is unfortunate, because a mouse doesn't really serve the purpose of a paddle, but you can almost get something done with it. Indeed, I was able to get some results using my mouse as a paddle replacement, but it's mostly a matter of luck combined with trial and error. Unfortunately, I don't own a VIC-20, so I cannot test the game on real hardware, nor do I have the original instructions manual for it. But I do know that you need at least 16kb extra RAM for the VIC-20 to run the game, which already says that it's going to be impressive... in a VIC-20 sort of way. Moving on to the C64 version, we see that the first big difference to the VIC-20 version is, that you have detailed in-game instructions provided for each event. For the most part, the controls are fairly simple, if a bit tricky on their timing, and you rarely need to waggle your joystick. In the very possible case you don't have the original VIC-20 game with its manual on you, I suggest you read through these translated instructions for each event, as well as how to start the game in Finnish mode - which is currently the only way to play the C64 version. About 99.9% of you lot, who have a copy of the game, will have it as the widely available disk image. The first thing that pops onto the screen after the game has loaded in, is a TV mode selection. "Valitse televisiotyyppi" means "choose the type of television you have"; choice number one is for a colour TV and choice number two is for a black-and-white TV. The next screen is the main menu, if you can call it such. The top section has entry slots for four players, in which you need to enter names for as many players as you like. "Kilpailija" means "contestant". Below, you see the choosable events, "kilpailulajit". 1. Juoksut = Running events. This selection features six different running distances: 100m, 400m, 800m, 1500m, 5000m and 10000m. 2. Moukarinheitto = Hammer Throw. 3. Kiekonheitto = Discus. Literally: disc throwing. 4. Pituushyppy = Long Jump. 5. Kolmiloikka = Triple Jump. 6. Keihäänheitto = Javelin. Literally: spear throwing. 7. Kuulantyöntö = Shot Put. 8. Korkeushyppy = High Jump. 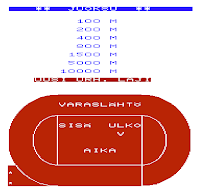 The VIC-20 version also features Pole Vault ("seiväshyppy"), and the order of events is slightly different. Because the C64 version is still without a translation, I shall be doing the translations in the C64 order of the events, but first, I think explaining the menu items between events could be called for. "Ohjeet" means Instructions, "Pistetilanne" shows the current scores, "Aloita peli" means Start the game (or more precisely, the event), and the last item in the main event menu is the title of the next event. In the VIC-20 version, apart from the running events, the game doesn't allow you to skip the current event straightaway, but you can choose to have zero attempts (out of the maximum 6 possible), and then choose "Uusi urheilulaji", which literally means "New event", which will then load the next event. Screenshots from the C64 running events (juoksut); instructions on the left, action shots on the right. Screenshots from the VIC-20 running events. Top: event menu. Bottom: action screen. In the C64 version, the instructions for the running events are as follows: "Two runners can run on the circuit simultaneously. Joystick in port 1 = outer track (ulko), and joystick in port 2 = inner track (sisä). Keep the joystick in neutral position until the start pistol has been shot, and then accelerate by pushing the stick" - this means, push the joystick up. "The speed of the runners is shown in the speed-o-meters on the edges of the screen. On long distances, it is recommendable to use your strength with consideration, whereas on short distances, a quick spurt will give good results. After a false start, the start pistol will automatically shoot again after a few seconds. Two false starts will disqualify a player. If you run too fast (for longer periods of time), your runner will get tired and withdraw from competition. Both lanes are equally long." So, turning these words into practice, you only really need to worry about pushing and pulling the joystick up and down to control the speed of your athlete, so that the speed won't be too tiresome, but will still be as fast as possible. Apparently, the paddle controls for the VIC-20 version requires you to use both extremes of the paddle to adjust the power, but it's practically impossible to play this event on an emulator, because you need to start the event with the paddle controller in a certain position. Screenshots from the C64 Hammer Throw (moukarinheitto); instructions on the left, action shots to its right. 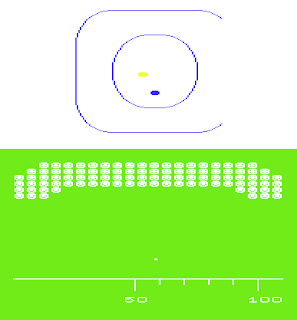 Action screens from the VIC-20 Hammer Throw. Next: Hammer Throw. "When the athlete is within the throwing ring (platform), push the joystick forwards. Keep the joystick in forward position for four and a half turns, then let go of the stick, when you reach the front of the ring. This will make the hammer fly. The more exactly you get the hammer fly within the sector, the better the result." It's almost the same thing on the VIC-20, only instead of pushing the joystick up, you push the fire button on your paddle. Discus: "When the athlete is within the ring, press the fire button. In about two seconds, a signal will be heard, and a mark will flash on the screen. When it happens, push the joystick up, keep it there for about 1.5 rounds and let go. You can also try to anticipate the signal and push the joystick up before that. The closer to the signal you make your move, and the better the disc hits the sector, the better the result." Similar differences for the VIC-20 version as in the above event. Also, the graphics are similar to the Hammer Throw event, so showing you screenshots of the event would be a waste of space. 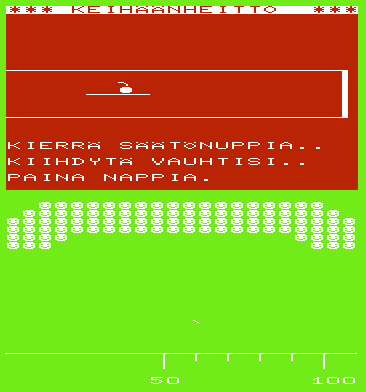 Screenshots from the C64 Long Jump (pituushyppy) and Triple Jump (kolmiloikka) events. Long Jump and Triple Jump events. Long Jump is a bit trickier. "Quickly press the fire button (to ignite the attempt). Take note of the flashing arrow, which is pointing at your step sign. Shove the stick up to make your athlete run. When the athlete reaches the step sign, press the fire button down, and keep it down until you're right at the plank. Jump by letting go of the fire button before the athlete touches the plank. The more precise your pressing and letting go of the fire button, the better the result." In the VIC-20 version, the fire button does all the necessary actions. Triple Jump is kind of similar to long jump, as you would expect, but the difficult part is in the middle. But just for the sake of clarity: "Quickly press the fire button (to ignite the attempt). A flashing arrow will appear for a short time to point out the step sign. Push up to start running. When the athlete is at the step sign, press the fire button down, and keep it down until you're right at the plank. You take off by letting go of the button. Press the fire button again for the duration of the second leap. The more precise your pressing and letting go of the fire button, the better the result." For the VIC-20 instructions, consult the above paragraph. Screenshots from the C64 Javelin (keihäänheitto) event. Screenshots from the VIC-20 Javelin. Javelin is the only event, in which you need to actually waggle the joystick in a traditional Decathlon-like fashion. "Press the fire button to get the running track on the screen. Move the joystick sideways back and forth in order to get as much speed as possible for the thrower. The throw is performed by pushing the fire button. Remember to take into account the stopping distance, which depends on your running speed." Since the VIC-20 version is played on a paddle controller, you need to rotate the paddle back and forth to build up speed. 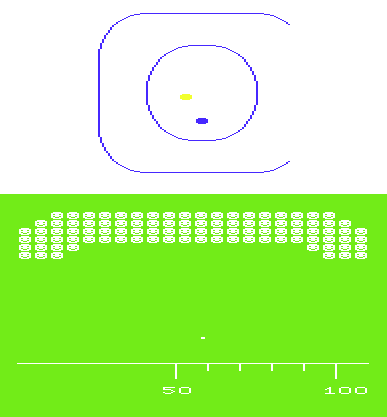 The most difficult event in the VIC-20 version to get in terms with is Shot Put. Not because it's exactly /difficult/ to control, but rather because you have no idea if your adjustments ever take effect. You are supposed to rotate the paddle to adjust the value shown in red, but I have never seen anything happen to the value. On a few lucky attempts, I have managed to get the shot put past the first line on the ground, but I have no idea how that happened. The C64 version plays very differently, and it instructs you thusly: "A white scale shows up on the screen. The best results will be achieved by getting the black dot as close to the top-right corner of the scale as possible. The athlete's stamina will affect the controllability of the black dot. The time you are able to spend on controlling is always the same, and it begins when you start moving the joystick." High Jump is the last event in the C64 version, and it's also one of the easiest, even though the instructions feel a bit off. "First decide, if you want to jump the current height. If you do, push the joystick forwards; if not, pull the joystick backwards, thus giving the turn to the next contestant. Each contestant will jump on their turn by tapping the fire button in a solid and fast rhythm." The VIC-20 version of the event is similar, but seems to be more based on luck than the C64 version, perhaps due to the awkward pseudo-3D viewpoint. Finally, we get to Pole Vault, which was only made for the VIC-20 version. At first, it looks similar enough to the High Jump event, but there's an added feature that you must take into consideration. 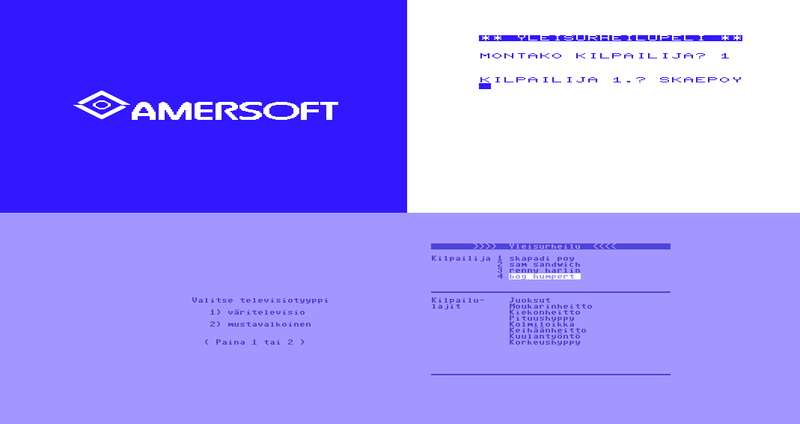 On the left side of the screen, you see a blue rectangle, within which you will see flashing letters: V and O in the original Finnish version, or L and R in the English translation. Basically, you have to push the left and right paddle buttons in the given rhythm in order to be successful. Much like the High Jump event, the results will feel more like the work of luck, rather than skill. The final results are shown after the final event, and after having seen them, you can either restart the game or end it then and there. Ending the game will reset the computer in the VIC-20 version, and the C64 version will merely stop the program and throw you in the Basic prompt. Having gotten used to joystick-waggling from an early age, particularly in traditional Decathlon-type games, Yleisurheilu's controls feel unintuitive and perhaps overthought. Maybe the idea was to save joysticks from too forceful waggling from people with no technique, and in that sense, they were successful. Too bad it's not a very easy game to start playing without spending time getting yourself reacquainted to the controls, and even then, some of the events feel too random to be actually good. But - and this is a big BUT: Yleisurheilu is a very basic game, which is also loaded in many segments. It looked helplessly dated at best already in 1985 on the C64, and comically bad on the VIC-20 with flickering animations on PETSCII graphics. Perhaps now, the badness of the game's graphics adds some charm to it, but for some part, they also make the game less playable. At least there's more graphical variety here than in the Activision Decathlon, so it has some reason to be a multi-loader. Yleisurheilu has no music at all, and very little of sound effects. It might even come as a surprise, that the VIC-20 version actually has MORE sound effects than the C64 version, the most impressive of them being the audience cheering when you get good enough results, the length and volume of which varies along with your results. Although Yleisurheilu cannot be called much more than an overblown exercise in basic game programming, it was a huge deal in the barely established Finnish game industry in 1984, and it shared the first prize of a game developing contest organized by one of Commodore's Finnish importing companies (Toptronics? PCI-Data?) 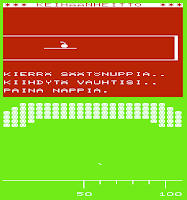 in 1984 with a VIC-20 title, Mehulinja by Simo Ojaniemi. 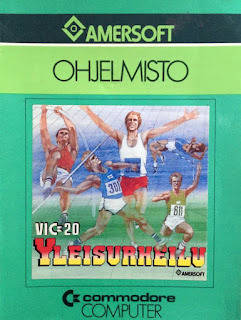 Taking the time of development and the quality of other Finnish games at the time into consideration, then sure, Yleisurheilu is definitely impressive, particularly on the VIC-20, but it cannot be denied that it barely gets you in a properly competitive and sporty mood, like the often cursed joystick-waggling games like Decathlon, Track & Field, Hyper Sports and the Daley Thompson series do, and the lack of skill involved here is laughable. At best, Yleisurheilu is a curious piece of Finnish gaming industry history, and a fun little challenge to attempt to play, but after a while, the curiosity factor wears out. Not very recommendable, but worth a look, if only for its historic value. This is not quite as far as is possible to go back in the history of Finnish games, but it's as far as I'm willing to go in this particular series. Commercially, only a few other games had been made before Yleisurheilu, and they were all too simple to call for an in-depth review in this series. The properly good stuff really started popping up after 1985, and there aren't too many of them left, which is why I shall leave this series for a break for now, and perhaps will continue with the 90's stuff, when I feel like it - just to have some break from the C64 stuff. Hi, I was suprised to find this blog fom internet while googling other things. I programmed these Yleisurheilu -84 games about 34 years ago and my big brother Juha still has some unopened gameboxes left. When AmerSoft released the games, I was bit disapointed, because they changed the original game idea almost to all events. Joystick waggling was something I didn't like at all. In original game each event had a bit different idea, and the success was based on good tactics, reaction speed, accuracy, timing and rhythm. I also programmed a random luck-factor with effect of 20% for the result. So the results came 80% from talent and 20% from luck. For example in short running events the reaction speed to start pistol had big effect to the result and in longer runs good tactics was the key, i.e. you should spare your energy properly, still keeping good speed, to be fast enough but not exhaust behore the finish line. The Paddles were brilliang game control devices until joystick replaces them. With paddles you had two personal independent game fast control devices (you could set instantly any integer value between 0-255), so one could play with his/her own tactics, and other player can't see it. The Padlle was a control device, but also a "display", because you could physically estimate the paddle value from the knop. In these days we had memoriable game sessions with friends and siblings, not just with the Yleisurheilu -game, but with many other unpublished games I programmed, like Hockey game, tank-/ minegame and serial poker tournament -game (integrated poker/trick cad game played with real cards, but scoring and statistic controlled by Vic20 / C64. And this website and game review is very professional with thorough description and good pictures. Thank You! Hei, monet kiitokset erittäin avaavasta kommentistasi Mika! (Many thanks for the revealing comment!) 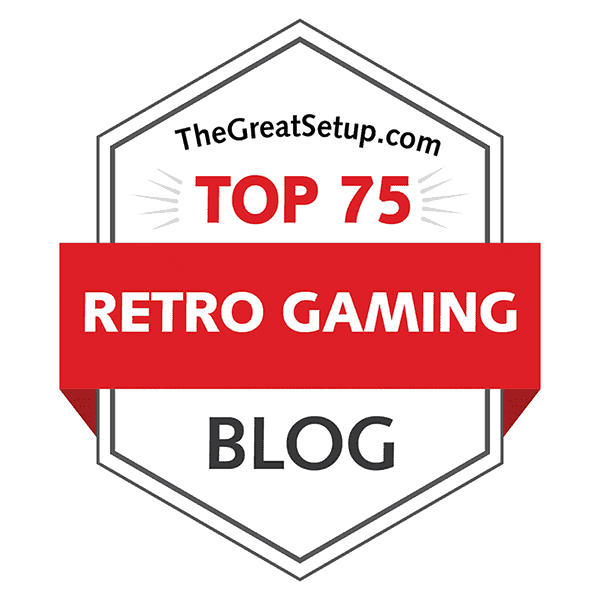 And sorry for the VERY late reply, but I'm sure you've noticed this blog has been left unattained for a good reason lately. Anyway, great info there, explains why the game is as it is. It would be interesting to see the game as you intended, as well as the unpublished ones! Thanks again!